What does a South American sasquatch of sorts and the world's longest species of toad have in common? 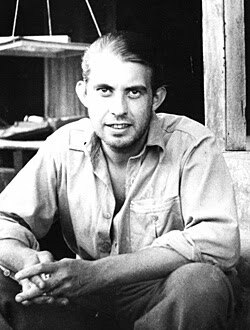 Perhaps I ought to rephrase that question, and ask who, rather than what, because the answer is the late Rolf Blomberg (1912-1996) - a Swedish explorer, photographer, and writer. As fully documented in my books The Lost Ark (1993), The New Zoo (2002), and the near-completed third edition of these books of mine on new and rediscovered animals, in 1950 Blomberg was instrumental in bringing to scientific attention a hitherto-undescribed species of giant toad native to southwestern Colombia. He achieved this by capturing a huge specimen there that he brought back with him to his home in neighbouring Ecuador, and which became the type specimen of this spectacular new species - duly dubbed Bufo blombergi in his honour a year later. Blomberg's giant toad can attain a total snout-to-vent length of up to 10 in (25 cm), which is greater even than that of the heavier, more massively-built cane toad B. marinus, the world's largest toad species. "He [Blomberg] had a colleague, a Danish man called Harry Nielsen, who himself had searched actively for the creature. And he even heard the alleged wailings at night from the beast, but while exploring he found that the source was a puma. Blomberg had, however, heard about two cases that made him take Sacharuna a bit more seriously than most. One case was a young girl that disappeared from her home but was found alive in the jungle some time later. She claimed that she had been kidnapped by an apelike creature, as big as a man, who gave her food but showed with grunts and gestures that if she tried to escape, he would kill her. She was interrogated several times by her parents and not once she did contradict herself. "The other case was about a friend of Blomberg's, Emilio Bonifaz, who visited the area where Harry Nielsen had already searched for Sacharuna. He too heard odd noises from the jungle and was informed that that was the sound from the apemen. The locals claimed that at least three Sacharuna lived in the area, and that a few years earlier one was killed. The hunters showed Bonifaz where they buried the body, and Bonifaz excavated the spot. He did find bones, but so fragmented that it was impossible to draw any conclusions. "He also searched around for giant anacondas, but concluded that such stories were likely exaggerations." Reports of man-beasts or wildmen have been discounted as sightings of mentally deficient outcasts or feral recluses/hermits on many occasions down through the ages, especially in relation to European woodwose, so this theory is hardly a new one. Moreover, like Håkan, I am not convinced by it at all, certainly not in a locality like the Ecuadorean jungle - where it seems highly unlikely that such individuals would survive the multifarious dangers posed there by such major threats as jaguars, venomous snakes and spiders, all manner of poisonous plants, virulent diseases, and even by other tribes. In contrast, there is a rich heritage of man-beast reports and sightings throughout the South American continent's dense tropical rainforests, so if this is the identity of the sacharuna, it would merely be another such example rather than a cryptozoological novelty. It now seems pretty well established that the infamous Loys's 'ape' Ameranthropoides loysi, as pictured propped upright with a stick underneath its chin in the famous 1920s photograph snapped during a Venezuelan expedition led by Swiss geologist Dr Francois de Loys, was a hoax - merely a dead spider monkey with its tail chopped off or hidden from view. Nevertheless, many other reports of similar bipedal ape-like beings untainted by this incident are also on file, and palaeontological discoveries here include the fossils of various huge species of spider monkey far bigger than any known to survive today. In my view, if a South American counterpart to the large anthropoid apes of the Old World has indeed evolved convergently, and is still awaiting formal discovery by science amid this continent's remote verdant wildernesses, it may well have done so from the spider monkey lineage. A cryptozoological animal is usually defined as one whose existence is known to the local people sharing its habitat but which is not recognised by science. All of the major new terrestrial species scientifically described and named since 1900 fitted this definition prior to their official discovery and recognition – the okapi, mountain gorilla, giant forest hog, Komodo dragon, kouprey, Congo peacock, Chacoan peccary, Vu Quang ox, and giant muntjac, to name but a few. Notwithstanding this, there is at least one very distinctive mammal whose existence had genuinely remained hidden from its human neighbours until its formal scientific discovery – and that is the pichiciego (aka pichiciago) or pink fairy armadillo. No bigger than a mole, this extraordinary little creature is the world’s smallest species of armadillo, and is native to the dry grasslands and sandy plains of central-western Argentina, where for much of the time it remains underground, using its huge front claws to agitate the sand so that it can then quite literally swim through it, as easily as if it were swimming through water. 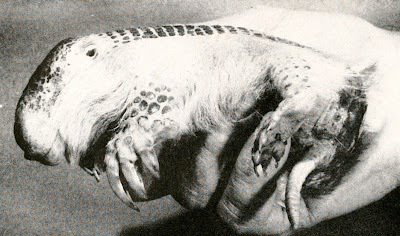 So rarely is this cryptic animal seen above-ground, however, that the local people were astonished when in 1824 zoologist Prof. Richard Harlan from the University of Philadelphia unearthed a pichiciego at Mendoza. Nothing like it had ever been seen before, either by them or by zoologists, and when he officially described its species in 1825, Harlan christened it Chlamyphorus truncatus – sole member of an entirely new genus. Unlike the much thicker, tougher, and more comprehensive body armour of other armadillo species, the plates of the pichiciego are notably thinner, and only loosely attached to its skin by a thin membrane running along the vertebral column. In addition, none but its pelvic armour is hardened, and breast armour is completely lacking. However, its head armour extends beyond the horny nasal plate (probably to compensate for the fragility of the creature’s skull), and its broad-ended tail also has a covering of armour. As one might expect from a predominantly subterranean, fossorial species, the pichiciego’s eyes are extremely small, and its external ears are nothing more than tiny folds of skin. Even today, this most minuscule of armadillos is so elusive and seldom seen that television naturalist Nick Baker’s recent search for it in Mendoza, as featured in an entertaining episode of his ‘Weird Creatures’ series from 2008, ended in dismal and seemingly inevitable failure. Despite setting 20 pitfall traps and persuading the local fire brigade to drench the search area’s sand dunes with water in the hope of stimulating some pichiciegos to surface (after learning from the locals that these rarely-spied creatures appear more frequently after rainfall), a dejected Nick ultimately conceded defeat, having to be satisfied instead with viewing a preserved specimen in the home of a villager. Indeed, on the few occasions when a pichiciego is encountered, it is usually captured alive and maintained in the living state for as long as possible by its fascinated captors before it is finally preserved in mummified form as a highly-prized curio. "For hours we wandered under the bright sun, trying in vain to find tracks of the pichiciego. But in the vicinity, wooden railway ties were being replaced, and the pichiciego was found in the rotting wood, probably attracted by the insect larvae inside." Altogether a very remarkable creature – so remarkable, in fact, that in the years following the pichiciego’s discovery by Harlan, no one expected to find anything else even remotely similar. 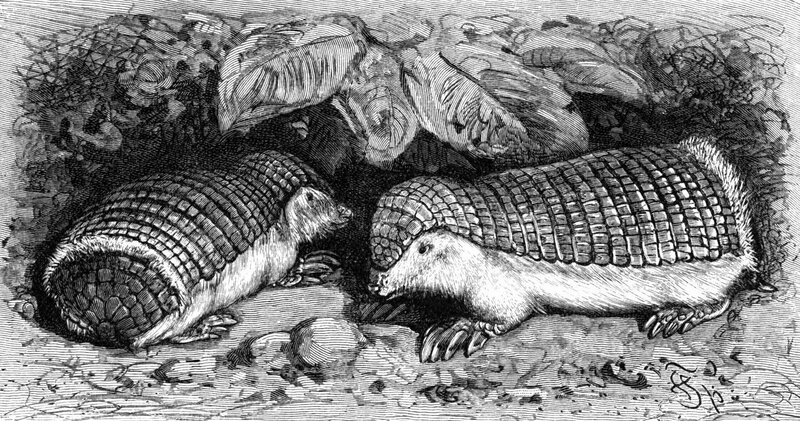 In 1859, however, while crossing the Andes via a route not previously utilised by Western travellers, German zoologist Prof. Karl Hermann Burmeister discovered in the possession of a native Indian villager the mummified remains of a hitherto unknown species of armadillo that superficially resembled a larger version of the pichiciego, and thus became known as the greater pichiciego. This intriguing species’ generic name has changed several times since it was scientifically described by Burmeister in 1863, and some zoologists no longer consider it to be closely related to the pichiciego. However, it is still commonly referred to as the greater pichiciego, and is known scientifically as Calyptophractus retusus, the only member of its genus. Even today, it remains scarcely-known, and much of the little information that has been documented about this mysterious mammal, which is native to Argentina, Paraguay, and Bolivia, was gained from observations made of a living specimen captured in Mendoza during July 1965, which was subsequently sent to Chicago’s Brookfield Zoo, where it lived until its death in December 1971. NB - All other illustrations here are 19th-Century engravings of the pichiciego. 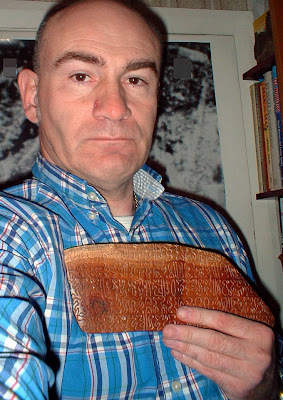 As you already know from my books The Unexplained (1996), Mysteries of Planet Earth (1999), and Dr Shuker's Casebook (2008), as well as from a wide range of articles, my interests in mysteries are not entirely confined to those appertaining to natural history. Consequently, here, for a change, is my examination of one of the world's most mysterious, enigmatic localities, which I was fortunate enough to visit just a few years ago. - WELCOME TO EASTER ISLAND! Not so long ago, in a magazine and internet survey to find the world’s most mysterious, paranormal locality, the runaway winner was a certain tiny triangular island (no more than 25 km across) separated by over 2000 km of southeastern Pacific Ocean from any other inhabited locality, formerly home to an extraordinary birdman cult, and ringed by numerous stone statues of enormous size and alienesque appearance that stare inward across their lonely domain through unseeing eye-sockets yet with a gaze as chilling as the rock from which they were hewn many centuries ago. 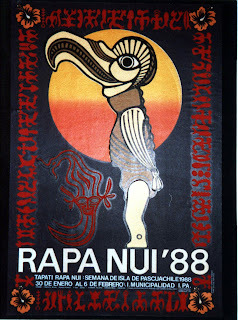 Where else could this be but Rapanui – or, as we know it better in the West, Easter Island. 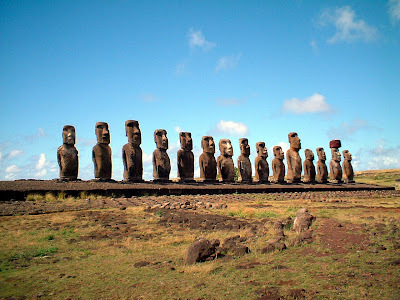 A special territory of Chile since 1888, Easter Island is so-named because it was first encountered by Europeans on Easter Sunday 1722, when it was reached by Dutch explorer Admiral Jacob Roggeveen. In April 2008, I fulfilled the ambition of a lifetime by finally visiting this truly remarkable island – containing three extinct volcanoes, a lush but entirely artificial flora and fauna almost entirely introduced by man from elsewhere to replace its own decimated native ecosystem, and only a single dusty town, Hanga Roa (with roughly 3500 inhabitants), which recalled to mind a 19th-century frontier town that had somehow been transported by cyclone far from its Wild West homeland and unceremoniously dropped down upon a fragrant tropical isle. 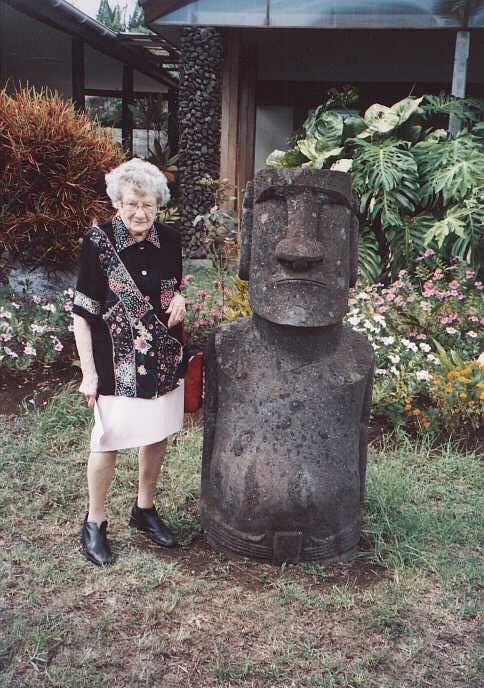 But whereas Dorothy and Toto met the munchkins and the wizard of Oz, I met the moai – or at least a sizeable representation of them. No amount of photographs or films can prepare you for the sheer scale and awesome majesty of these gigantic stone statues, Easter Island’s most famous denizens, coldly aloof and silent, their thin lips and haughty visage radiating Ozymandian disdain. Numbering over 800 in total, many are still inside the quarry, within the eastern volcano Rano Raraku, where they were originally hewn from tuff (an igneous rock ash). Some lie there fully formed, waiting for the acolytes that will never come, to transport them out of the volcano and down the slopes, to be erected with honour as protective icons upon a ceremonial stone platform known as an ahu. Once greatly venerated as the revered representations of their sculptors’ ancestral leaders, and also as the earthly vessels of their leaders’ spirits, even today the moai command respect and deference – it is illegal merely to touch one of these stupendous monuments. 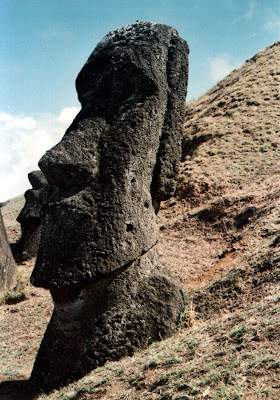 Having said that, some moai have not even been detached from the inner rock face from which they were carved. Consequently, everywhere that you look within this volcano’s obsidian depths there is a surreal juxtapositioning of heads, noses, brows, elongate ears, and hooded eye-sockets, staring imperiously but sightlessly upwards and inwards at every conceivable – and inconceivable – angle, like a particularly febrile nightmare of Picasso, Dali, or Hieronymus Bosch. A fair few did make the journey out, however, and today they can be found in many locations around the island. A number stand half-buried in grassy soil on Rano Raraku’s outer slopes, like a scattering of abandoned chess pieces on a giant’s forgotten chessboard. Others still lie in prone humiliation, where they were deliberately tipped over centuries ago by warring clans, but in modern times a select company have been raised and re-erected onto their ahus at various sites by teams of visiting researchers. With the exception of an ahu of seven moai at Ahu Akivi at the island’s centre, which look out towards the sea, all moai were originally erected by their sculptors near the island’s edge and faced inward, overlooking their clans as protective effigies. Such sites include Ahu Tongariki (restored with 15 moai) on the island’s southeastern edge, Ahu Nau Nau (with seven moai) at Anakena on its eastern edge, and Ahu Kote Riku at Tahai on its northwestern edge. Until Thor Heyerdahl’s famous first archaeological dig here during the 1950s, it was not generally realised that a moai is more than just a giant head. In reality, it is carved down the hips, with a pair of spindly arms and long-fingered hands pressed closely to its bulbous torso’s sides. However, so many moai were half-buried in soil and other deposits after centuries of gradual concealment by natural encroachment from sediment and plant life that their true nature was not realised until Heyerdahl oversaw the first scientific excavation of a moai, revealing its entire form. On Rano Raraku, I encountered torso-buried heads that were 6 m tall, so when you add to that the height of the hidden body, it becomes evident that these extraordinary statues are indeed gargantuan, far bigger than anything even remotely similar to be found elsewhere in the world. 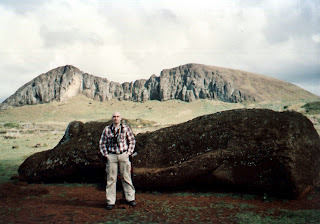 Biggest of all is El Gigante, which would have stood a colossal 23 m high if it had ever been transported out of Rano Raraku, but this petrified giant remains here, its vast weight (estimated at over 145 tonnes) probably proving too much for even the most enthusiastic sculptors and workers to overcome. Like so much of Easter Island’s past, the history of the moai is enshrouded in controversy and mystery. Estimates as to when they were created vary by as much as a millennium depending upon the authority consulted. The current consensus (discounting Heyerdahl’s problematic views of a South American origin) is that the island was first colonised in the 4th Century AD, by seafaring Polynesians, who subsequently split into separate, independent clans or kin-groups, and began constructing ahus and carving statues of modest proportions a few centuries later. By the 15th Century, however, moai production had reached frenzied proportions, as indeed had the moai themselves – now monstrously huge. Then, so abruptly that many of these statues were simply abandoned where they lay, complete or still in various unfinished stages of carving inside Rano Raraku’s volcanic bowels, moai production ceased. This is believed to be due to increasing rivalry and hatred developing between the various clans, culminating in violent battles and, as highly symbolic desecration, purposefully toppling over each other’s sacred moai. Another factor is the wholesale destruction of the island’s once-luxuriant native foliage, most notably the giant palm trees that were eventually felled across the entire island. Their sturdy trunks were used as rollers on which to transport the moai from Rano Raraku to their chosen sites elsewhere, but once the palm trees had vanished, the moai could no longer be moved. ALIEN RAYS AND THE STATUES THAT WALKED…? Having said that, tree-trunk rollers (and also sledges constructed from trunks) may well be the orthodox explanation for how the moai were moved, but it is not the only one that has been proffered. Highlighting the paranormal links to Easter Island, proponents of the ancient astronauts school of belief have suggested that visiting aliens transported and erected the moai using anti-gravitational beams released from their spacecraft. 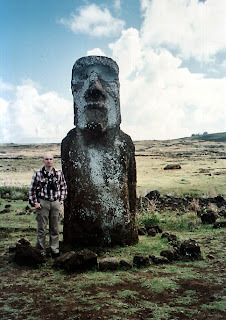 Another suggestion is that the natives somehow levitated the moai by harnessing electromagnetism. And my Rapanui-born guide noted that according to traditional native lore, the moai themselves very obligingly walked to their chosen sites during the night, utilising a special life-force called mana. Then again, she was smiling when she said this. 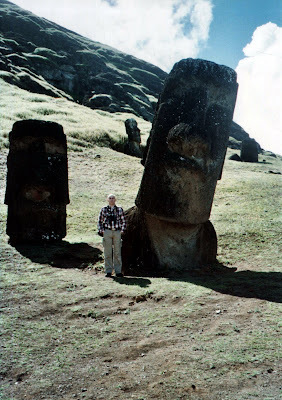 In any event, the moai are certainly left strictly alone following the onset of darkness, because even during the sunny daylight hours many visitors have reported experiencing a dark, unfathomable feeling of oppression and apprehension when in the presence of these stark, brooding sentinels. Some moai originally bore on their heads a huge ceremonial topknot or pukao, carved from red scoria rock transported from Puna Pau, a quarry in the island’s southwestern region. How these enormous blocks were raised onto the moai’s heads, well over 6 m high in some cases, remains unresolved. A few of the lately re-erected moai have their pukao in place, but these were placed there using modern-day cranes. Most intriguing of all, thanks to the unearthing of an intact example in recent years, is the realisation that the moai originally had eyes. 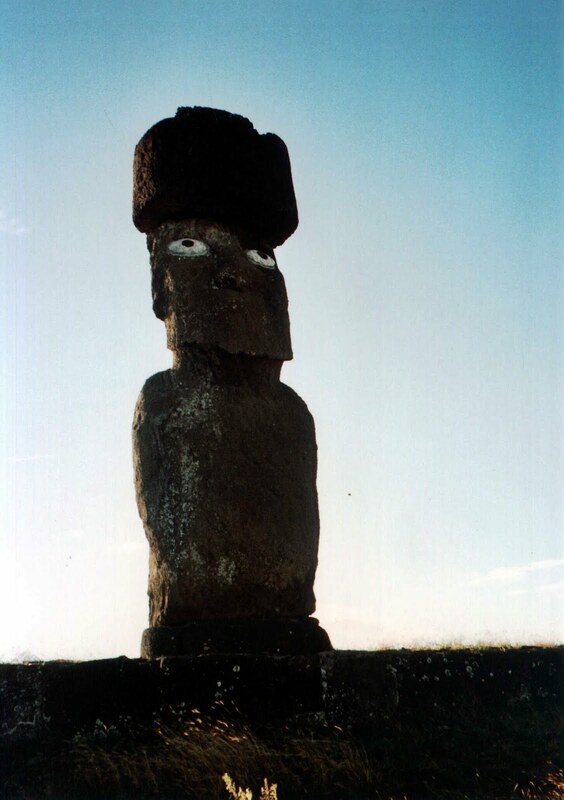 These were made from white shells with pupils of black obsidian, but were destroyed or removed during the inter-clan battles that marked the end of moai production. BIRD-HEADED MEN AND LONG-EARED GHOSTSLess famous but no less extraordinary than the moai of Easter Island, and further earning it its claim as the world’s most mysterious, paranormal location, is its erstwhile birdman cult. The cliff faces around Rano Kau, the island’s westernmost volcano, are liberally etched with striking birdman petroglyphs depicting bizarre bird-headed humanoids, often curled up in almost foetal pose – which if nothing else is fitting, given that this volcano’s slopes also harbour a prehistoric village called Orongo that contains many remarkable stone houses supposedly representing the human womb. Until as recently as 1878, when the arrival of Christianity here swiftly suppressed it, the election of the Birdman each September was a very significant event. Every clan sent a representative to Orongo to compete for the birdman title. The competition consisted of scaling down the steep, jagged cliffs of Rano Kau into the sea and swimming through shark-infested waters to a small outlying islet called Moto Nui, where the objective was to collect an egg newly-laid there by a small seabird called the sooty tern, and bring it back safely to Orongo. The winner would be duly crowned the Birdman or Tangata Manu, bringing great glory and esteemed status to his clan, because the Birdman was deemed to be the living reincarnation of Makemake, Easter Island’s eminent fertility deity. He would then be taken away to live in solitude for the next 12 months inside a sacred cave on the other end of the island, at the foot of Rano Raraku. The birdman cult is no more, and even its origin remains unknown, but its image lives on, sometimes in the most surprising locations. There are a number of underground cave systems on the island, including Cave of the Cannibals, whose walls are profusely decorated with birdman carvings, but when viewing them, just pray that the light does not illuminate the cave’s more frightening inhabitants – the moai-kava-kava, the ghosts of the ancestral long-eared clan chiefs, said to haunt this subterranean domain! The birdman image has also been utilised abundantly in modern-day signs and gifts for sale in Hanga Roa, but perhaps the most unexpected location for birdmen is inside the town’s church, where Christian icons share its inner sanctum with statues of bird-headed humans. As if the moai, birdmen, and assorted ghosts were not mysterious enough, Easter Island can also boast an indecipherable native script language – rongorongo. Carved on wood, these hieroglyphics could only be read by the native elders and priests, but when Peruvian slave raiders reached the island during the 1850s-60s, all of its educated native men were transported to Peru’s guano mines as slaves, where they soon died, leaving no-one behind on Easter Island who could decipher the rongorongo tablets. Even today, these cryptic scripts remain largely unexplained, and the few surviving rongorongo tablets are priceless relics in museums. Whereas Easter Island may not lay claim to such overtly or ostensibly supernatural phenomena as headless horsemen, baying werewolves, or weeping statues, as someone who has experienced the sheer unearthly nature of this truly strange locality, stood in the chill shadow-casting presence of its grim monolithic moai, and shivered in the stygian gloom of caverns populated by countless carvings of grotesque long-beaked birdmen I can well appreciate why this lonely Pacific Island has been voted the world’s most paranormal place. Sometimes, not seeing a ghost (long-eared or otherwise) can be more unnerving than seeing one! Today, 20 January 2011, is the second anniversary of the launching of my ShukerNature blog, so it seemed an appropriate time to make what I hope will be for many of you an exciting announcement. After recently receiving a number of requests, enquiries, and affirmations of interest in such a publication, I’ve decided to prepare a ShukerNature compilation volume, containing a sizeable selection of my blog’s most popular and unusual posts, and as many as possible of the original illustrations that have accompanied them. Moreover, as my blog posts would not be complete without the numerous fascinating and fact-filled comments that so many of you have kindly posted here in response to them, I would also like to include a selection of these in my ShukerNature book. Consequently, I’d like to take this opportunity to ask whether anyone who has contributed comments would have any objection to my including them in my book. All such comments that I do decide to use will be inserted directly after the respective posts re which they were originally submitted, just as they are here on the blog; and apart from minor correcting of typing/spelling errors, they will not be edited in any way but will appear exactly as they do here. As I am hoping to see the ShukerNature book in print by the end of this year, if there is indeed anyone who for any reason whatsoever would prefer for their comments not to be considered for inclusion, please contact me asap - ideally, before the end of this month, January 2011 - so that I can act accordingly in response to your wishes. Thanks very much! 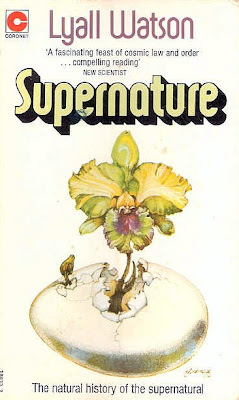 And yes, in response to a number of queries, my blog’s title, ShukerNature, was indeed inspired by the late Lyall Watson’s classic bestselling book, Supernature: The Natural History of the Supernatural (1973). In fact, I believe that it was the CFZ’s very own Oll Lewis who first suggested it – thanks, Oll! 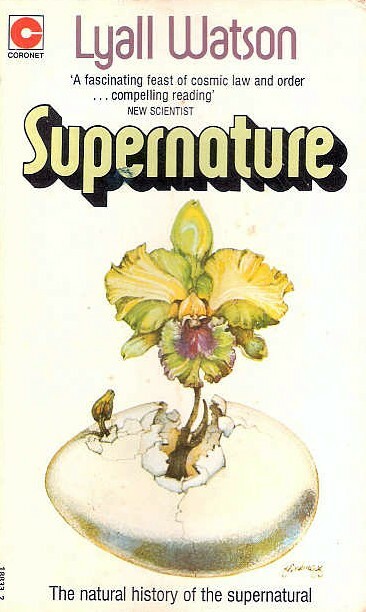 And who knows – I might even incorporate my own unique version of that book’s iconic front cover image (see photograph below) – a flowering plant growing out of a chicken’s egg – on the front cover of ShukerNature: The Book! Meanwhile, I wish to offer a massive, sincere vote of thanks to all of you for reading and supporting this blog during these first two years – without your enthusiasm and interest, it could not have survived – and I now look forward to sharing many more cryptozoological secrets and surprises, as well celebrating many more ShukerNature anniversaries, with you in the years to come! Over the years, there have been countless considerations of giant sea monsters, but what about the real, original leviathan? This colossal mystery beast of the Bible - "the piercing serpent...that crooked serpent...the dragon that is in the sea" (Isaiah, 27:1) - is, after all, the creature whose name has ultimately become an umbrella term for large, unidentified water beasts everywhere - as evinced by Tim Dinsdale's classic book on this subject, The Leviathans (1966, 1976). 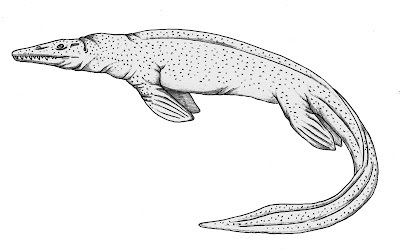 The Old Testament contains four references to this monstrous sea creature, which provide several important morphological features - including its huge size, extensively scaled body, elongate shape, large plentiful teeth, shining eyes, powerful neck, smoking nostrils, and distinctive fins. Biblical scholars have nominated several different animals as the leviathan's identity, but whereas each possesses some of its characteristics, none has all of them. The most popular identity is the Nile crocodile Crocodylus niloticus, which is indeed scaly and somewhat elongate, with an abundance of large teeth, a powerful neck, shining eyes, and a sizeable (albeit not enormous) body. 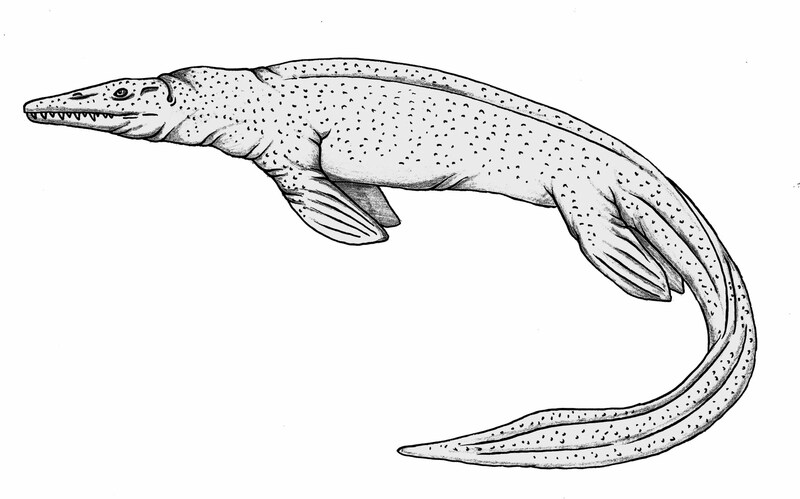 However, it possesses neither fins nor smoking nostrils, and is not marine in habitat. Sharks are marine and finned, some are very large and fairly elongate, and many have plenty of large teeth, but not smoking nostrils, shining eyes, or scales. Whales are also marine, finned, often very large and quite streamlined, and some have many large teeth. Moreover, the spray spouted upwards from around their blow-holes when they exhale could conceivably be distorted into smoke during the telling and retelling of leviathan reports over successive generations - but whales are neither scaly nor shiny-eyed, and their necks are almost invisible. And so it goes on - even identities as unlikely as the rock python Python sebae have been offered in a desperate attempt to reconcile this exceptional creature with a known type of animal. Most probably, the leviathan is a non-existent composite, part-myth and part-reality. 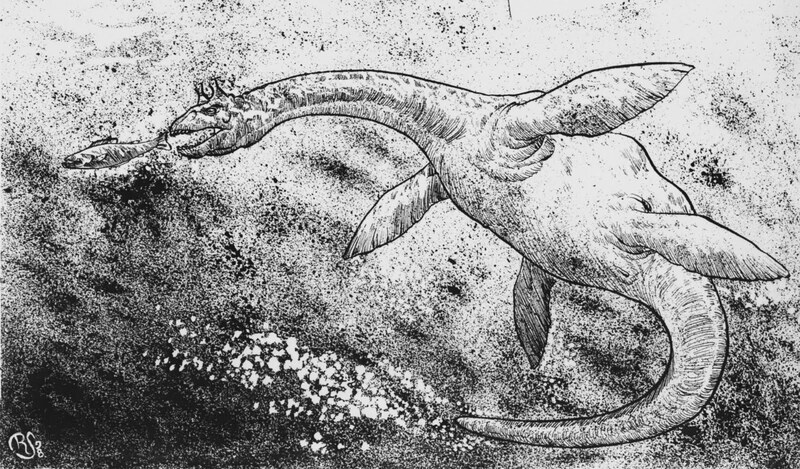 The latter component comprises a hotchpotch of distinctive features drawn from all of the animals noted above, and possibly one other too - a bona fide sea serpent. On account of its scaly skin, veteran cryptozoologist Dr Bernard Heuvelmans considered the leviathan to be of the 'marine centipede' type. 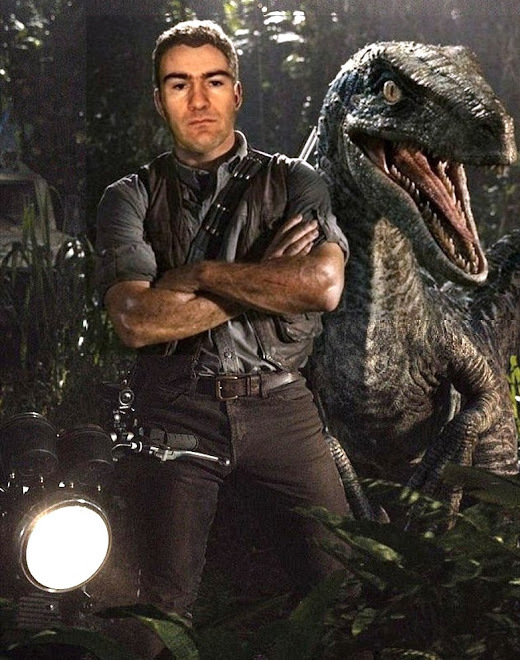 (Thus, according to his belief in what those creatures are, it would have been a modern-day armoured archaeocete - however, we nowadays know that such beasts never existed, as they were merely artefacts caused by archaeocete fossils being fiound in association with scales from other, unrelated creatures.) 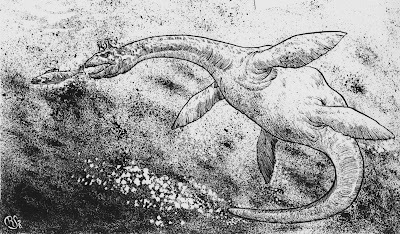 Conversely, I believe that if the leviathan is either a sea serpent or a myth inspired in part by sightings of one, then it is more likely to be a living mosasaur. Indeed, this identity uniquely combines all of the leviathan's features - its scaly body, elongate shape, shining eyes (typical of many large reptiles), powerful neck, fins, great size (as with the tylosaurs), large plentiful teeth, and smoking nostrils (as with the whale identity, no doubt a reference to the spouting of water displaced from around its nostrils when exhaling underwater). Yet only a complete specimen can conclusively test this hypothesis. "Canst thou draw out leviathan with an hook? ", asks Job (41:1). Judging from science's singular lack of success in securing the carcase of any type of genuine water monster via any of the traditional means utilised in capturing aquatic animals, the answer to this question would appear, quite definitely, to be no! Clearly, then, it is time to develop a different means of obtaining such evidence - one commensurate with the sophisticated technology now available for scientific research - for until such evidence is obtained, all of the leviathans documented by water monster chroniclers down through the ages will continue to remain an abiding mystery. "Let the relations of the sea-serpent be what they may; let it be serpent, saurian, or fish, or some form intermediate to them; and even granting that those relations may never be determined, or only at some very distant date; yet, nevertheless, the creature must now be removed from the regions of myth, and credited with having a real existence, and that its name includes not one only, but probably several very distinct gigantic species, allied more or less closely, and constructed to dwell in the depths of the ocean, and which only occasionally exhibit themselves to a fortune-favoured wonder-gazing crew." It is a sad reflection of zoology's longstanding disinterest in the subject of water monsters that those words are as relevant today as they were more than a century ago. In the summer of 1983 I visited the Vorderasiatisches Museum, part of Berlin's Staatliche Museums, to gaze upon one of the most spectacular monuments from ancient history - the magnificent Ishtar Gate of Babylon. Many other visitors were also peering intently at this marvellous edifice, sumptuously decorated with life-like depictions of various animals, but to me it had an extra significance - for out of all of the people there, it is possible that I alone realised that we could well be looking at the portrait of a living dinosaur! During his reign (605-562 BC), King Nebuchadnezzar II of Babylonia in Mesopotamia oversaw the creation of his empire's capital, the holy city of Babylon, dedicated to Babylonia's supreme deity - Marduk. Babylon was encircled by huge walls, wide enough for chariots to be driven along their summits, and pierced by eight huge gates. The most magnificent was the Ishtar Gate, through which visitors passed in order to enter the city. Befitting such an important edifice, the Ishtar Gate was a spectacular sight, comprising a colossal semicircular arch, flanked by enormous walls and leading to a breathtaking Processional Way, along which visitors walked to reach the city's religious centre. The gate, its walls, and the procession walls were covered by a brilliant panoply of highly-glazed enamelled bricks, yielding a backdrop of vivid blue for numerous horizontal rows of eyecatching and very realistic bas-reliefs of animals. On the gate and its flanking walls, six rows of fierce grey bulls alternated with seven rows of grim golden dragons, and along the processional walls were two rows of haughty marching lions, but the most important member of this trio of mighty beasts was the dragon - for this was the sacred beast of Marduk. Following the eventual fall of Babylonia, its walls and gates became buried underfoot, and their glory was hidden for many centuries - until 3 June 1887 when German archaeologist Prof. Robert Koldeway, during a visit to the site of Babylon, found a fragment of an ancient blue-glazed brick that stimulated his curiosity and led to a full-scale excavation beginning in 1899. Three years later, the animal-adorned Ishtar Gate rose up from the dust of the past like a cobalt phoenix, revealing its bulls, its lions - and its exalted but enigmatic dragons. Most commonly referred to as the sirrush or mushrushu (two different transliterations of an Akkadian word loosely translated as ‘splendour serpent’), the Ishtar dragon was a source of great bewilderment to Koldeway. 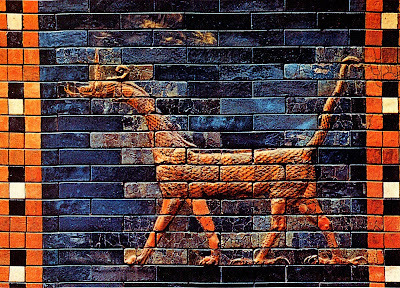 For whereas archaeologists were well aware that the depicted appearance of all other seemingly fabulous, mythical animals in Babylonian tradition had changed drastically over the centuries, depictions of the sirrush (as also present on seals and paintings predating the Ishtar Gate by at least a millennium) had remained the same - just like those of real animals, like the lion and bull. Did this mean, therefore, that the sirrush was itself a real-life species? But if it was, what could it be? Certainly, it did not - and still does not - resemble any animal known to be alive today. After all, what modern-day species has a slender scaly body, with a small head bearing a pointed horn (or a pair - the Ishtar sirrush is only depicted in profile) on its forehead and ringlet-like flaps of skin further back, a long slender neck, a pair of forelimbs with lion-like claws, a pair of hindlimbs with eagle-like claws, and a long tail? Some authors have suggested a giant monitor lizard, but the sirrush’s horn(s), ringlets, and extremely long neck contradict this identity. Boldly, Koldeway announced in 1913 that the creatures to which the sirrush most closely corresponded in his opinion were the dinosaurs. Moreover, he deemed it possible that in order to explain the unchanging nature of sirrush depictions, and also various mentions of dragon-like beasts in the Bible, some such creature must have been kept within one or more of Babylon's temples by the priests of Marduk. By 1918, he had refined his belief, identifying the ornithischid dinosaur Iguanodon as the closest fossil relative of the sirrush. If, however, the sirrush was truly a creature of historic, rather than prehistoric, times, where had it originally come from - there is no evidence that giant reptilians were ever native to Mesopotamia - and how could it have evaded scientific detection? This mystery greatly intrigued cryptozoological investigator Willy Ley, who suggested that the only locality from which such a creature could have been originally transported to Babylon during the reign of Nebuchadnezzar but yet remain wholly unknown to modern-day science was Central Africa, and in his book Exotic Animals (1959) he recalled various accounts concerning the mokele-mbembe and other swamp-dwelling dinosaurian beasts reported from this portion of the Dark Continent. 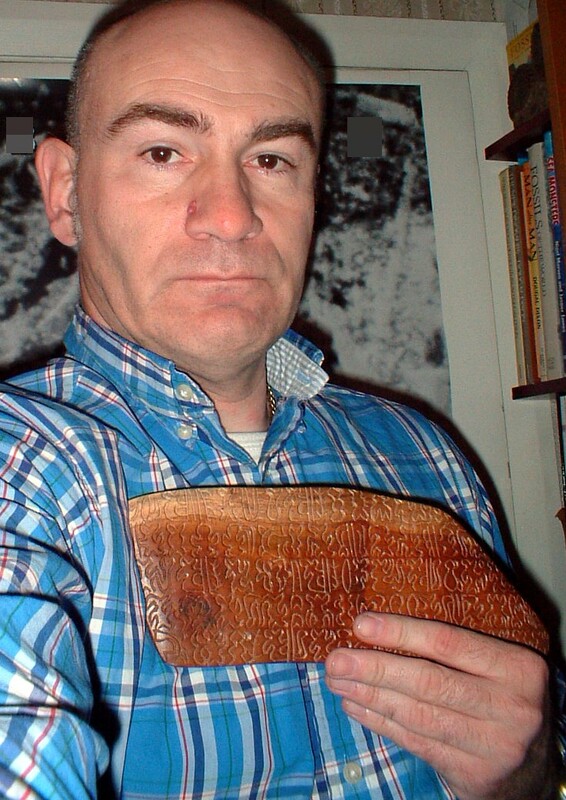 In addition, when Schomburgk returned to Europe from Central Africa during the early 20th Century with tales of living dinosaurs, he also brought back a glazed brick that he had found there - a brick just like those in the Ishtar Gate. Is this where the far-travelling ancient Babylonians had obtained them, along with stories - and perhaps even the successful capture from time to time - of real-life dragons? Others have since expanded upon Ley's views, and the prospect that the sirrush was a living dinosaur has gained interest, but opinion as to the precise type of dinosaur has moved away from Iguanodon toward a sauropod dinosaur, notwithstanding the sirrush's horn(s). Initially, the sirrush is hardly reminiscent of such creatures. 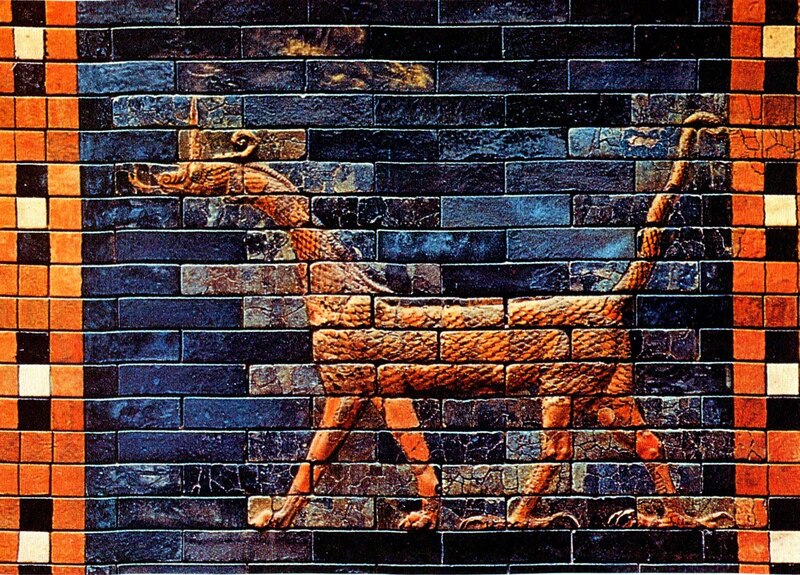 If, however, the Chaldean artists responsible for the Ishtar Gate bas-reliefs and other sirrush portrayals had not actually seen a living sauropod with their own eyes but were relying solely upon descriptions of one, then it is not too difficult to accept the resulting sirrush as nothing more dramatic than a distorted depiction of a sauropod, no doubt embellished by its creators' imagination. One Biblical reference that inspired Koldeway's belief in the onetime existence of a real-life sirrush maintained by Babylon's temple priests is an episode documented in the Apocrypha concerning Daniel, who, after discounting an earlier deity as nothing more than a brass idol, was shown a mysterious creature housed within the temple of the Babylonian god Bel, and which was venerated by the fearful populace. "And in that same place there was a great dragon or serpent, which they of Babylon worshipped. And the king said unto Daniel, Wilt thou also say that this is of brass? Lo, he liveth, he eateth and drinketh; thou canst not say that he is no living god: therefore worship him. Then said Daniel. I will worship the Lord my God: for he is a living God. But give me leave, O king, and I shall slay this dragon without sword or staff. The king said, I give thee leave." True to his word, Daniel accomplished his vow - via the unusual if effective expedient of choking the creature to death by forcing lumps of bitumen, hair, and fat down its throat - a brave act if genuinely faced by a conflagrating dragon, but one that will not endear him to cryptozoologists if it is ever shown that his adversary was nothing more rapacious than a morose mokele-mbembe a long way away from its home amid the Congolese swamplands. Lo, now, his strength is in his loins, and his force is in the navel of his belly. He is the chief of the ways of God; he that made him can make his sword to approach unto him. He taketh it with his eyes: his nose pierceth through snares." Over the centuries, four principal identities have been touted by theological and zoological scholars - the ox, Nile crocodile, elephant, and hippopotamus. Least popular is the ox - apart from its herbivorous nature, it has no similarity to the behemoth. Only the New English Bible supports the crocodile's candidature - certainly, the concept of a vegetarian crocodile is an implausible one, to say the least. The elephant's supporters are also few - only Prof. George Caspard Kirschmayer in Un-Natural History of Myths of Ancient Science (1691) and Dr Sylvia Sikes in The Natural History of the African Elephant (1953) have seriously attempted to link the two great beasts with one another. The most popular and (until recently) most favourable pairing of the behemoth has been with the hippo - whose cavernous mouth, prodigious drinking capacity, mighty build, sturdy skeleton, swamp-dwelling lifestyle, herbivorous diet, and status as the largest animal native to the Bible lands compare satisfactorily with the behemoth - but not conclusively. How, for example, can the hippopotamus "moveth his tail like a cedar"? This description implies a very long, powerful tail - not the puny, inconspicuous appendage sported by the hippo. And then came a late entry in the identity stakes - a living sauropod. As veteran cryoptozoologist Prof. Roy Mackal, seeker of the elusive Congolese mokele-mbembe during the 1980s, persuasively pointed out in A Living Dinosaur?, not only the description of the behemoth's tail but also all of the features hitherto likened to the hippopotamus are equally applicable to one of these giant vegetarian dinosaurs. Moreover, the great size attributed to the behemoth, while far exceeding that of the hippo would be much more compatible to a sauropod of mokele-mbembe proportions. Compare the Bible's description of the behemoth (given above) with Mackal's defence of his sauropod identity for it (given below), and judge for yourself. "The behemoth's tail is compared to a cedar, which suggests a sauropod. This identification is reinforced by other factors. Not only the behemoth's physical nature, but also its habits and food preferences are compatible with the sauropod's. Both live in swampy areas with trees, reeds and fens (a jungle swamp). Indeed, the identification of the biblical behemoth as a sauropod dinosaur provides excellent correspondence between the descriptive features in the biblical text and the characteristics of these dinosaurs as inferred from the fossil record." Equally interesting concerning this sauropod link is that the book of Job was written sometime between 700 and 2000 BC, thereby considerably predating the Ishtar Gate's depictions of the sirrush. Clearly, then, the gate did not inspire the behemoth account - instead, this was based upon something very large and visually impressive that was known in the Middle East long before the birth of Nebuchadnezzar. Initially, the Bible must seem the last place where zoologists would expect to find details of living dinosaurs - but if living dinosaurs (or travellers' reports of them) were known in this region of the world at this particular time in man's history, the Bible is unquestionably the first place where zoologists should look for evidence of their existence. Perhaps now, then, thanks to a long-overdue cryptozoological scrutiny of this ancient treasure trove of natural history lore, the vital evidence has at last been disclosed. As you know, my poetry has its own separate blog – Star Steeds and Other Dreams (named after and devoted exclusively to Star Steeds and Other Dreams, CFZ Press: Bideford, 2009, my first published volume of poetry). This is because most of my poems do not deal directly (if at all) with cryptozoological subjects, but a few do. So here, for mystery beast lovers everywhere, making its debut on ShukerNature after a previous outing on Star Steeds, is one such example, which also happens to be a little snippet of crypto-history – the very first piece of writing that I ever penned (over 30 years ago!) in relation to the most famous mystery beast of all. Nessie, this one’s for you! Of water black and cold. From bygone days new fame? With terror of their forms. Trolls are famously frightened of sunlight and the tolling of church bells, but did you know that they are also scared of thunder and sometimes transform into ball lightning? No? Well you do now, and so do I – thanks to an extremely interesting email that was kindly sent to me just a few days ago by a ShukerNature reader. One of the delights of writing this blog has always been the receipt of additional and often very unexpected, significant information from its many readers and followers, some of whom post their thoughts and data directly here, whereas others send theirs to me privately. In this vein, after emailing me previously with valuable new data in response to my post on the night-raven (and which I duly included in full within the comments section of that post), on 8 January 2011 Swedish correspondent Håkan Lindh sent me another very informative and enlightening email, but this time on the subject of Scandinavia’s most famous folkloric entities - trolls. 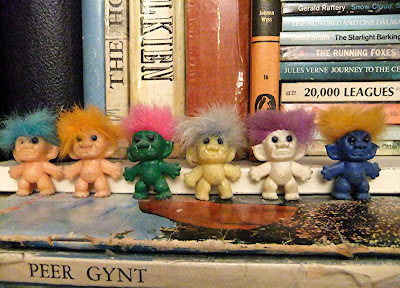 From these Westernised toy trolls, it was just the smallest of steps for me to begin reading in British and American books of fables and folklore about more traditional, Nordic trolls – or what I had at least assumed until now were traditional Nordic trolls. Here I came across all of the classic troll stereotypes – slow-witted, hideously ugly, huge, hairy, and unclothed, living underground during the day and only emerging at night, liable to eat unwary humans if any strayed into their dark, forested domains, sometimes encountered lurking beneath bridges, and fated to turn to stone if caught above-ground by the first rays of the morning sun. 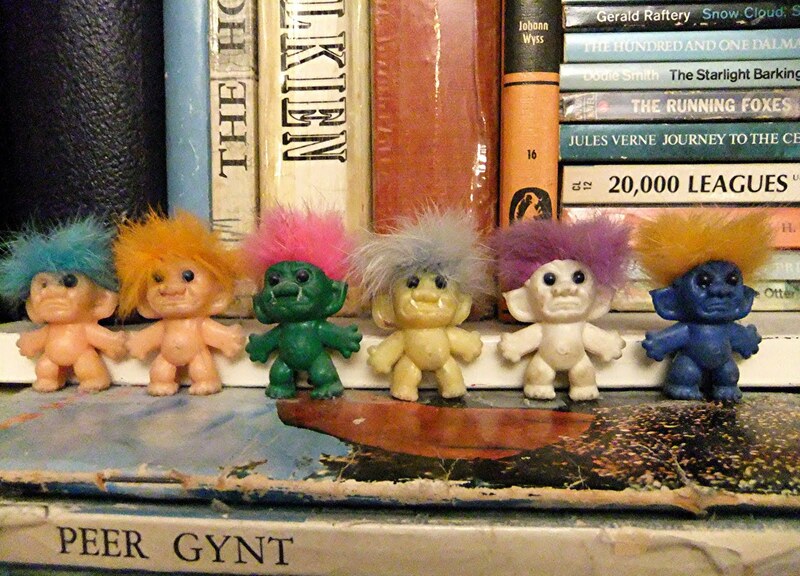 And then, in later years, along came cryptozoology, which introduced to me the exciting notion that perhaps trolls were more than just a myth. Could they instead have been inspired by misty, preserved memories from long ago of encounters between modern man’s ancestors and Neanderthal man? And could some of these latter have even survived into historical times, explaining reports of woodwose or hairy wild men allegedly spied in various of the more remote reaches of Europe? Moreover, there were even suggestions that perhaps trolls were man-beasts, comparable to the Himalayan yetis and North American bigfoot. "I have been interested in cryptozoology for as long as I can remember, but I’m also very sceptical of the value of folklore as a source. Sure, stories may sometimes hide grains of truth, but folklore itself spins that according to its own "rules". "The early folklorist/ethnographer Hyltén-Cavallius did a serious cryptozoological survey in the nineteenth century Sweden about dragons. His theory was that dragons really were a Scandinavian species of python, so he sent out advertisements to get in touch with witnesses. And people did contact him, but it is obvious that what they told him was of no real substance, exaggerated stories of grass-snakes and the staples from dragon-folklore mostly, so it ended in nothing. Hyltén-Cavallius sure was a pioneer, but also seen as something of an eccentric already in his own time. His theories about trolls and giants were also seen as too much. "Besides a general knowledge of a phenomenon, I’m unsure if there are much facts to find from folklore. "I read a few years back on the net about cryptozoologists trying to identify our trolls as some kind of bigfoot, and that is very strange indeed. 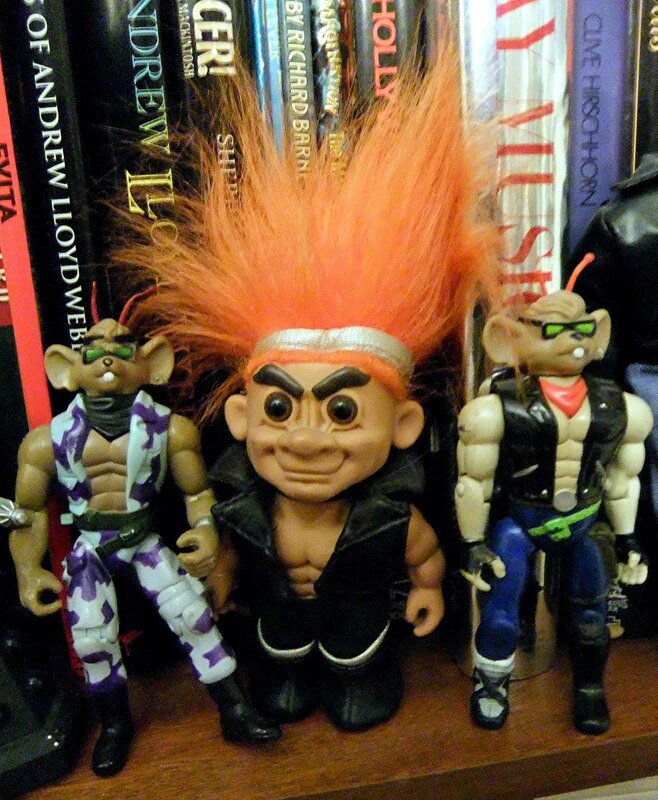 Trolls are never described as giant apelike animals, they are people living in societies, wearing clothes, having laws and language etc just like humans. They are not even very monstrous to look at, troll-girls especially could even be exceptionally beautiful. However, they were magical, and "contrary" to humans. They lived under cliffs and mountains, they shunned steel, they feared thunder, were not Christian, and were cunning thieves. As shapeshifters they were most often seen as shadows, animals or "balls of string" (ball-lightning perhaps), and of course often they were invisible. "After the industrialism arrived, illustrators of children’s books like John Bauer created the "modern" troll, but those were not the trolls people actually believed existed once. "So there is nothing in the real folklore that connects trolls with bigfoot-type cryptids. No more than British fairies actually. 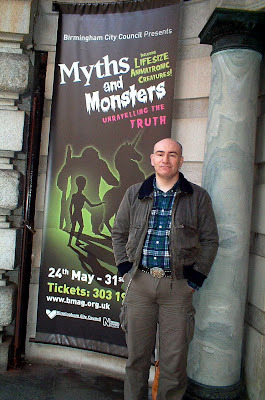 "But cryptozoology will continue to be a favourite interest of mine, just as folklore is, even if I’m sceptical about [whether] the two subjects will really meet very often." Troll societies bound by laws and gifted with language, the wearing of clothes, exceptionally beautiful troll maidens, and the ability to change into spheres of string or lightning? It all sounds less like the grunge-associated trolls of yore that we all thought we knew, and more like the synopsis for a new slick fantasy movie franchise. Just in case you were wondering from its title, you can rest assured that in this latest ShukerNature post I shall not be blogging about video games or cartoon television series! Instead, I’m continuing a theme that I began a few weeks ago when I blogged about dicephalic (two-headed) snakes, but this time the category of teratological duplication under consideration here is even more unusual, and is known as diprosopia or craniofacial duplication. This is a very rare congenital disorder in which part or all of an individual’s face is duplicated on its head. An individual exhibiting this condition is called a diprosopus, and examples have been recorded from many different species, including our own, Homo sapiens. Very rarely, diprosopia can result with a pair of conjoined twins in which not only the body and limbs but also the majority of the head of one twin has been absorbed into the respective regions of the other twin. Only the persistence of the absorbed twin’s face, positioned alongside that of the other twin, exists as evidence that this individual was indeed a pair of twins at some earlier point in its development. But what has any of this to do with Sonic the Hedgehog? I’m glad you asked! The much more common mechanism by which diprosopia occurs is one that results from the action of a protein known (honestly!) as sonic hedgehog homolog (SHH), whose name was indeed inspired by the eponymous video game character. SHH controls the width of facial features, so if produced in excess it causes the abnormal widening of these features and also the duplication of facial structures. Moreover, the greater the widening, the more of these structures are duplicated, often yielding mirror images of one another. Very occasionally, the two faces of a diprosopic individual are positioned back to back, but usually they are situated virtually side by side. 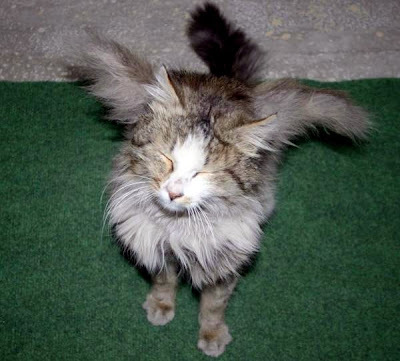 For some reason as yet unclear, diprosopia occurs with surprising frequency in domestic cats. And indeed, I first learned of this extraordinary condition when I read about a two-faced kitten aptly dubbed Gemini in a report published by the National Enquirer on 11 October 1983. Gemini was one of four kittens born to the pet cat of Dan Lizza, from Latrobe in Pennsylvania, USA. The other three kittens were normal. I confess that when I first saw the published photo of Gemini, I had doubts as to its authenticity, but once I began researching the condition I discovered a number of other feline cases, some of which had been documented in great detail. 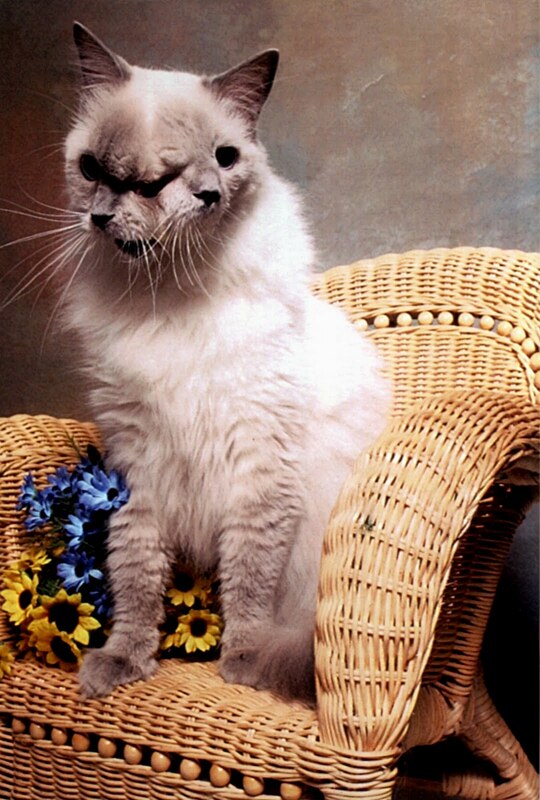 Bizarre though such cats may look, diprosopia was indeed a genuine teratological phenomenon. Surprisingly, however, they had never been given a suitable colloquial name. ‘Two-faced cats’ was open to confusion with the expression ‘two-faced’, which of course refers to someone who is duplicitous in behaviour, rather than morphologically! And the relevant scientific term, ‘diprosopus’, hardly runs off the tongue with ease. Happily, my lifelong interest in classical myths and legends came to the rescue. One of Roman mythology’s most famous deities is Janus, god of doorways, who has two faces. Consequently, when, several years ago, I began preparing in my spare time what is now the forthcoming book from which this post is excerpted – Cats of Magic, Mythology, and Mystery – I duly coined the much more precise and readily enunciated term ‘Janus cats’ (and, by extension, ‘Janus kittens’) for these remarkable felids of the double visage. One of the best documented Janus cats was a grey kitten that very closely resembled Gemini, but hailed from West Hartford, Connecticut. One of four kittens born to the pet cat of John Jansen on 22 April 1931 (the other three were normal), she possessed two complete faces, each equipped with its own nose, mouth, and pair of eyes, but the two faces shared a single pair of ears. Moreover, the right eye of the left-hand face and the left eye of the right-hand face were contained within a single eye socket (orbit), though the eyes and eyelids themselves were separate. Sadly, this little Janus kitten only lived for five days, although during that time she seemed to be thriving very well, suckling successfully with her left mouth. Ironically, as suggested by Thomas Hume Bissonnette, the researcher from Trinity College in Hartford who documented her case in the Journal of Heredity, her death may well have been related far less to her diprosopic condition than to the enormous amount of handling that she received from her many curious visitors, and the inevitable lack of sleep that she suffered as a result of this. A rather more extreme case of diprosopia was exhibited by the Janus kitten documented in the Anatomical Record for 1950 by biologists T.U.H. Ellinger, R.M. Wotton, and L.J. Hall from Duquesne University, Pittsburgh. 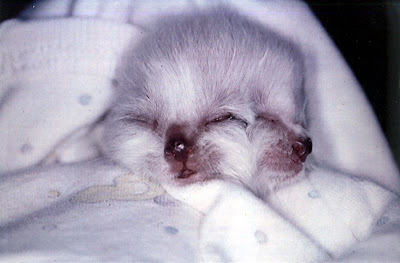 In this specimen, which lived for just one day, the right eye of the left-hand face and the left eye of the right-hand face were totally replaced by a single medially-located eye, just like that of the legendary one-eyed cyclops giants, but with the remaining eye in each face being totally normal, thereby yielding a three-eyed kitten. Diprosopia often occurs in conjunction with various other congenital disorders, such as anencephaly, neural tube defects, and cardiac malformations. And even when the brain is present, it may exhibit a range of abnormalities, ranging from partial to complete duplication of brain structures, and/or underdevelopment of brain tissues. Consequently, many Janus cats (and other diprosopic animals) are still-born, and few of those that do survive birth go on to live for any length of time afterwards, let alone into adulthood. However, one very notable, vibrant exception to this tragic rule was a male individual owned by a lady called Marty S (I have her full name on file but am concealing her surname at her request), living in Millbury, Massachusetts. Named Frank and Louie, this exceptionally fit but very gentle, friendly, and contented Janus cat, belonging to the Ragdoll breed - with thick fluffy white fur and grey limbs and tail - had reached his sixth birthday by July 2006 and was still in fine health. What may well have assisted his survival was that although each of his two pale-grey faces had its own mouth, only one of them, Frank’s (on the right), was connected to an oesophagus, so only Frank could feed (in addition, Louie's mouth lacked a lower jaw). This thereby eliminated any risk of the cat choking from two quantities of food passing down into his single stomach at the same time. Like the Janus kitten documented by Ellinger et al., Frank and Louie only possessed three eyes – one functional outer eye (blue in colour) in each face and a shared medial one that was non-functional. "He grew up in a shoebox. He went to work with me every day for the first three months of his life. I put a tube down into his stomach and injected the formula with a syringe. That’s another reason I think he lived, because the anatomy is usually so messed up in these cases, and this way he didn’t choke or anything. They [the vets] told me ‘Don’t get too attached. You can try, but they die in a few days’. [But] he was gaining weight, and I started to get excited. I thought, maybe he’s going to live." And live he did, becoming so strong that he was eventually able to frolic with Marty’s other cats and even with her hefty 65-lb dog, who became his special friend. Marty even took him out for walks on a leash, where he was always guaranteed to attract plenty of attention. I haven’t been able to discover as yet whether Frank and Louie is still alive, but by his sixth birthday he had already become the longest-surviving Janus cat on record. 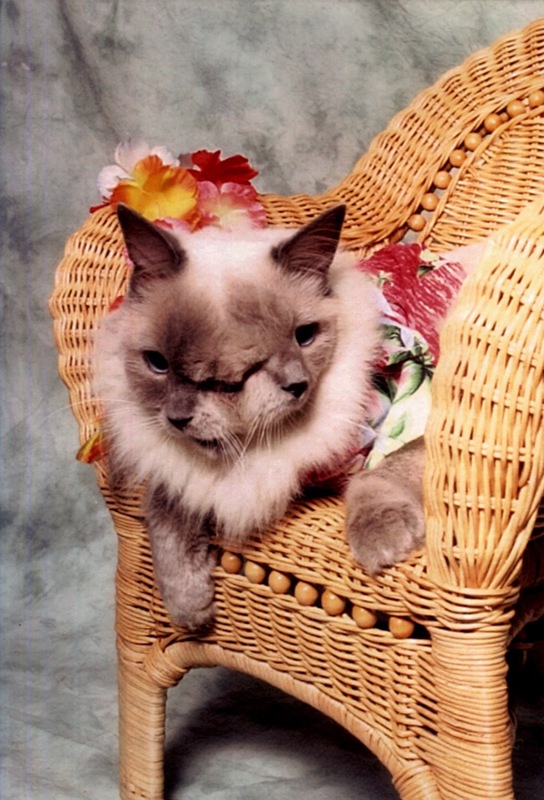 Which just goes to show that a cat with two faces can also have nine lives (or should that be eighteen?) if given enough love and care by a devoted owner. 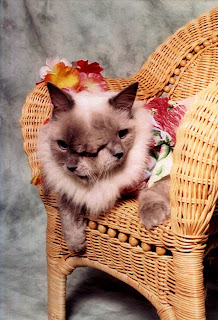 in order to view several videos of Janus kittens on YouTube, including an ‘Animal Planet’ video of Frank and Louie posted on 7 September 2008 (in which his name is transcribed as Frankenlouie to create a pun on Frankenstein). This video shows him to be a very sizeable, robust, and happily-purring adult cat – far removed indeed from the minuscule one-day-old scrap of fur destined to be put down, but saved and given by Marty a new shot at life, which he clearly grasped firmly and tenaciously with both paws! On 10 August 2011, I received an email from Marty, the owner of Frank and Louie, and I was delighted to learn that he is still alive, and will be celebrating his 12th birthday on 8 September! Truly, a remarkable record-breaker - so, wishing you a Very Happy Forthcoming 12th Birthday, Frank and Louie, from ShukerNature! Marty has also sent me a fascinating selection of photos of Frank and Louie, snapped at various stages in his life, including those reproduced here with her kind permission. Today - 15 September 2011 - the 2012 edition of Guinness World Records (formerly entitled The Guinness Book of Records) was published, and contains an entry confirming that Frank and Louie is the world's longest surviving Janus cat; as the Life Sciences Consultant for GWR, I had nominated Frank & Louie for inclusion, so naturally I was thoroughly delighted when my recommendation was formally accepted. Today, I was very sad to learn from his owner, Marty, that Frank and Louie had died. He had fallen ill a few days earlier, and after being formally diagnosed by veterinarians as suffering from a severe cancer he was euthanised yesterday to prevent him from suffering from what would soon be its traumatic effects. He was 15 years old, an incredible age for a Janus cat, far surpassing all previous examples and likely never to be surpassed by any in the future - a wonderful testament to the love and devotion that Marty had always given to him throughout his long and happy life with her. Rest in peace, Frank and Louie. The above account is an excerpt from one of my forthcoming books, Cats of Magic, Mythology, and Mystery. The pink elephants that featured in a truly surrealistic, psychedelic scene accompanying a certain very famous song from the classic Disney animated film ‘Dumbo’ that shared this particular ShukerNature post’s title were hilarious hallucinations arising from accidental over-quaffing of champagne by the little elephant with the big ears. 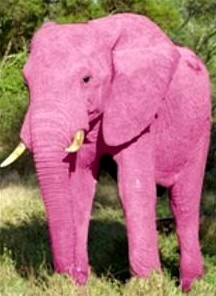 However, as revealed here, pink elephants have also been reported in reality, although we tend to refer to them more commonly, if less accurately, as white elephants. Let me explain. 1) A very pale pink/red skin, with even paler patches on the belly and inner limbs. 2) White hairs on its body and tail. 3) A very pale pink palate. 4) Eyes of light blue or pink colouration. 5) White toe nails (sometimes 20, instead of the normal complement of 18, is also needed). 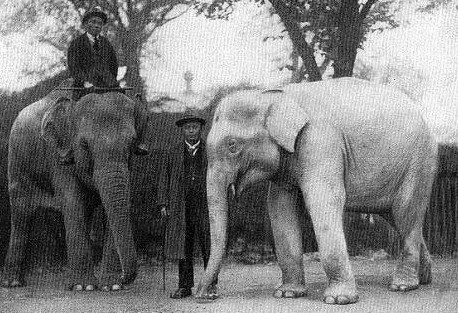 In the Journal of the Bombay Natural History Society for 1956, Tun Yin and the journal's editors collectively listed a number of white elephants recorded during the first half of the 20th Century. 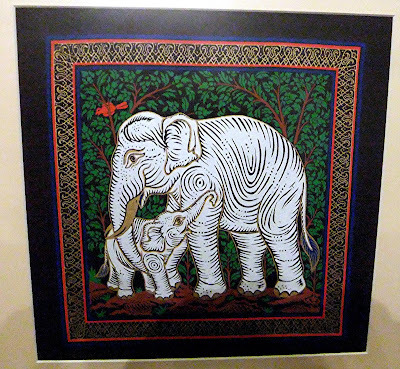 In its opening years, one white elephant calf was captured in the Kataha Forest Division of Burma (now Myanmar), and was presented to the Trustees of the Shwe Dagon Pagoda, but due to over-feeding by pilgrims it died soon after its arrival in Rangoon (now Yangon). Another specimen, captured in the Toungoo Forest Division and exhibited by its owner in Europe and America, died in Calcutta during its journey back home. A female calf born on 6 March 1918 to one of the elephants owned by the Bombay Burma Trading Corporation possessed a remarkably pale skin and pearl-coloured eyes, but was pronounced by a jury of prominent Burmese personages not to be a genuine Sinpyudaw, because it only had 18 toes and an unsatisfactory tail! In fact, it is just as well that they did dismiss its claim, because as it grew older its skin darkened very considerably, so it was likely to attain normal colouration by adulthood. 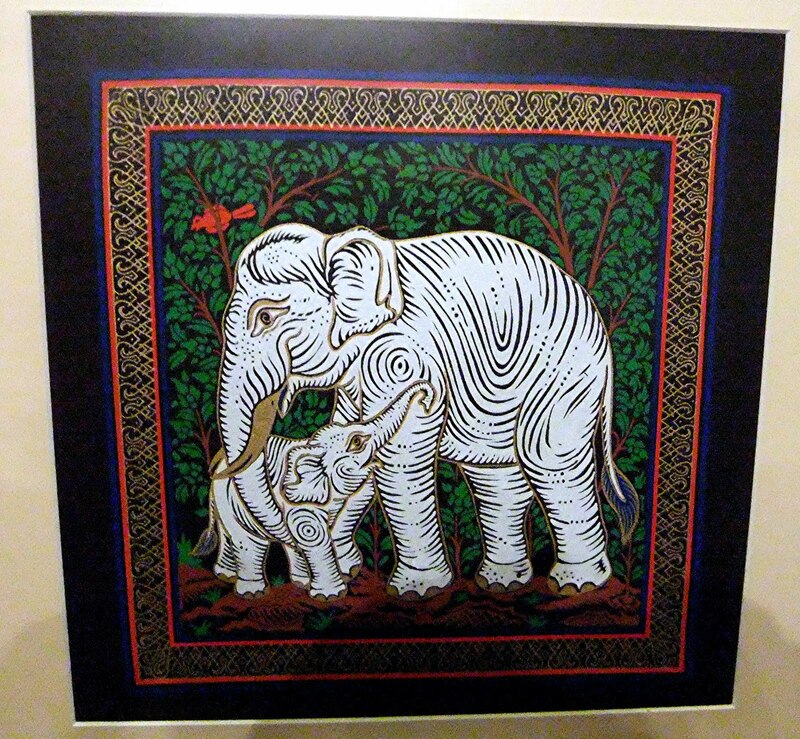 A few years later, conversely, another white elephant, this time born in northern Siam (now Thailand), was deemed satisfactory by local experts. Demonstrating the importance of white elephants in Thailand, there is even a Royal White Elephant Department in Bangkok, from which a deputy was dispatched to determine whether this latest specimen was indeed a true Chang Peuak. After careful scrutiny, he decided that it was. Three white elephants were discovered in Thailand during 1977, and were presented to King Bhumibol Adulyade. And in March 1983, an even more dramatic event took place - the discovery of a whole community of white elephants in Indonesia. Not only was it very surprising to find a community of such creatures, but also it was an equally important discovery zoogeographically, because this was the very first record relating to any white elephants in Indonesia. Plans were soon made to transfer this priceless herd to a wildlife sanctuary in order to ensure its protection - but by the time that the relocation efforts had been put into action, the elephants had moved on, and were not found again. Outside Asia, perhaps the most famous of all white elephants was a male called Hanno, who was given by King Manuel 1 of Spain to Pope Leo X (of the de Medici dynasty) upon his coronation in 1514. He soon became a great favourite of the pope but, tragically, Hanno died just two years later, on 8 June 1516, from complications caused by a gold-enriched laxative administered to him in order to treat his constipation. Even today, white elephants are still being recorded and revered. I have many modern-day reports on file, the most recent one dating from 29 June 2010, describing the capture three days earlier of one such individual, an adult cow aged about 38, in a western region of Myanmar hit by severe floods. This was the third white elephant captured in Myanmar since 2001 – the previous two were captured in the same western region in 2001 and 2002 respectively. Myanmar's state media announced that this latest white elephant would protect the country and would be taken to its new capital, Naypyitaw, where it would reside thereafter in luxury - a fitting fate for any priceless pachyderm, white or pink notwithstanding! The above account is an excerpt from one of my forthcoming books, The Anomalarium of Doctor Shuker. On 22 February 2010, I posted a Turkish report of a winged cat from Tunceli, one of two Turkish winged cat reports dating from mid-2008. Recently, Richard Muirhead kindly brought to my attention a good-quality Swedish news report video featuring the Tunceli specimen, which I had not seen before (prior to this, I had only seen two relatively poor-quality videos of the cat, whose urls can be found in the comments section of my 22 Feb 2010 blog). Swedish artist Richard Svensson has translated this video's Swedish narration for me as follows, and so too, on my Facebook page, has Danish zoologist Lars Thomas - thanks guys! "It’s got both fur and a ”meow”, but there is something weird about this kitty. It’s got wings. A woman first found the cat on her stairs, in the Turkish city of Tunceli. When the woman saw the wings on the cat, she got so startled she started to scream. The cat was scared off, but continued to prowl around the area, until a family decided to give the odd animal a permanent home. The cat seems to be enjoying itself, lapping up the milk. It’s inquisitive and cuddly, but, like most cats, also a bit untrustworthy [at this point in the video, the cat takes a bite at its owner!]. It’s not the first time someone’s discovered a winged cat. The media has, for example, reported about a winged cat from China. The curious affliction can be the result of many things, like deformed limbs, outstretched skin, and matted fur." For the most comprehensive coverage of winged cats ever produced, see the chapter on this subject in my book Dr Shuker's Casebook (CFZ Press: Bideford, 2008). Georg Wilhem Steller (1709-1746) was a German naturalist and explorer who took part in Vitus Bering’s Second Kamchatka Expedition to Russia’s Far East during the early 1740s, and whose greatest contribution to science was the discovery and description of several major new species of animal while the expedition was shipwrecked on Bering Island. These included a new jay, eider duck, sea eagle, sea-lion, and, most famously, a gigantic sirenian, Steller’s sea-cow Hydrodamalis gigas, which, tragically, was hunted into extinction within the next three decades, though there have been some intriguing modern-day reports of unidentified sea beasts resembling this extraordinary species (click here). Steller also documented three very puzzling creatures whose identities remain unknown to this day. One was an extraordinary sea mammal variously likened to a seal or even a merman, which has been dubbed Steller’s sea-monkey or sea-ape and was documented by me in my book Mysteries of Planet Earth (1999), excerpted here on ShukerNature. The second was a bird, Steller’s sea-raven, which I have chronicled in various articles and also here on ShukerNature. As far as I am aware, however, the third member of this mystifying trio is scarcely even remembered nowadays, has not previously been reported by me, and is known as Steller’s sea-bear. "Report, as I gather from the account of the people, has declared that the sea-bear, as it is called by the Rutheni and other people is different. They say it is an amphibious sea beast very like a bear, but very fierce, both on land and in the water. They told likewise, that in the year 1736 it had overturned a boat and torn two men to pieces; that they were very much alarmed when they heard the sound of its voice, which was like the growl of a bear, and that they fled from their chase of the otter and seals on the sea and hastened back to land. They say that it is covered with white fur; that it lives near the Kuril Islands, and is more numerous toward Japan; that here it is seldom seen. I myself do not know how far to believe this report, for no one has ever seen one, either slain or cast up dead upon the shore." Needless to say, this description readily calls to mind the polar bear Ursus maritimus – but there is one major problem when attempting to reconcile Steller’s sea-bear with the latter species. There is no confirmed record of the polar bear ever having been found anywhere near as far south as the Kuril Islands, let alone towards those of Japan. Could it be, as suggested back in 2002 by Steller scholar Chris Orrick, that reports of polar bears seen further north (this species was already well known in Steller’s time) had somehow become confused with those of fur seals, which are not white but are often loosely if inaccurately dubbed ‘sea-bears’ and are indeed found around the Kurils and Japan? 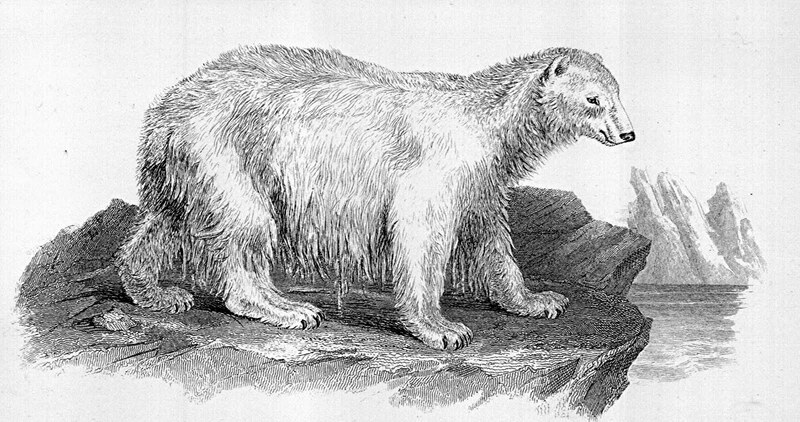 As for his treating the very existence of the sea-bear with suspicion, perhaps Steller was not aware of the polar bear’s marine behaviour, mistakenly assuming that it was exclusively terrestrial.